With the Lieutenant packs coming out soon I thought it would be fun to see them in a more heroic spotlight. Belthir is a natural fit for warrior. Unfortunately he's a bit too heavy as hero for normal flight, but if he burns both his actions moving he can fake it for one round. His Herioc Feat lets him lunge forward, borrowing his Cry Havoc Lieutenant ability word for word. Zachareth comes into play as a wizard archtype, and would fit in well as a runemaster. His Lieutenant abilities are represented in his heroic feat, which combines his Subdue surge ability with his Dominion power, allowing him to cripple any monster that dares look him in the eye. His attributes are extremely versatile for a wizard, representing his natural cunning and flexibility. Further adding to this is his Heroic ability that allows him to choose what condition is applied to him. Unfortunately with no low or high attributes no condition is guaranteed to disappear instantly. Alric, deadly as a Lieutenant, is equally intimidating as a hero. With pathetic speed and stamina he makes up for it with awesome health and an imposing black defense die. His immovable Lieutenant ability returns, but now with the added bonus of effecting adjacent heroes as well. 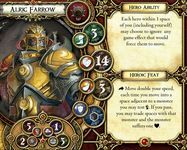 Combined with the Knight class, Alric can guarantee the safety of his charges, making sure they aren't moved from his side. His Heroic Feat lets him overpower his enemies, borrowing from his Overpower Lieutenant ability. Combined with his absurd strength, monster blockades mean nothing to him. 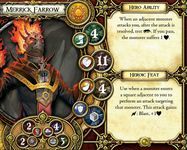 Merrick comes with a basic hero ability that borrows from his Aftershock Lieutenant ability, damaging monsters that attempt to attack him head on. His heroic feat attempts to mimic his Ignite ability, (The most direct translation is already being used by Leoric of the Book) allowing him a burst attack against a monster entering an adjacent square, that will unfortunately damage him along with the monster. Eliza rounds off the party, as the only healer. As a healer she has strong attributes, with strength as her only true weakness. Her basic hero ability gives her the same surge ability as Blood Call, letting her stay alive long enough to heal the rest of the party (Assuming she can get any damage in without a surge). If things get desperate she always has the option to seduce the enemies with her Heroic Feat, that allows her to stun every monster that's gotten a good look at her. Add in Serena and Raythen from LoR and there's a full selection of 2 warriors, 2 scouts, 2 healers, and 2 wizards to match the hero roster of the base game. EDIT: Added Ariad to the roster. Ariad has some pretty miserable stats with Average speed and Stamina, low health, and only a brown die to defend herself with. Her hero ability compensates for this, allowing her to cast powerful illusions to blend in with the very monsters that she is attacking. On the surface, her heroic feat looks abysmal too, since it costs an action and 3 fatigue for a mere aesthetic change. But the other side of the coin is a different beast altogether! 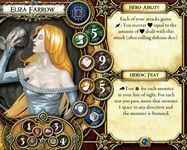 When Ariad uses her Heroic feat and flips her hero card she becomes the terrifying Queen Ariad! Armed with a mighty black defense die, 12 health, evenly divided attributes, and an extra green die to her attack pool. Though she sacrifices the tactical poise of her ranged attacks and illusions, she gains a powerful offensive form capable of changing the tide of battle. really love the idea and the heroes are quite good ! 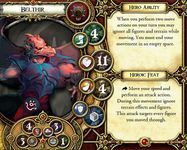 "Perform" is misspelled in Belthir's Heroic Feat, "receive" is misspelled twice in Zachareth's Hero Ability, and "Merick" should only have one R in it.. Otherwise, cool stuff. Not sure how often you'd see Merick's Heroic Feat used fully, especially once he gets an Act II weapon, but I suppose he can just NOT spend the Surge on Blast most of the time. P.S. You should do one for Valyndra, Ariad, Queen Ariad, and Bol'Goreth, too! Okay, I fully accept responsibility for the other misspellings, but the "Merrick" snafu falls squarely on the shoulders of the Descent Wiki. As for Merick's heroic feat, the problem is that "ignite" let's him take one damage for an attack that hits every adjacent figure, but sans the damage that's Leoric's ability word for word. I figured a close equivalent was an attack that had the potential to hit multiple targets but would also damage Merick in the process. 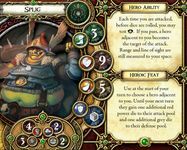 Hopefully you've got a sturdy knight like Alric to take the damage for you. Without that it's not an amazing power, but a free attack is still a free attack, even without blast. I'd change Merick's so that it just affects all adjacent monsters. But other than that, cool! Merick's new heroic feat borrows the "fire" elemental ability, making it really similar to Leoric's heroic feat. On top of that I just realized that his Hero Abiliy is almost exactly the same as Andira Runehand's, so Merick is copying lots of hero's powers. These are really cool! I'm looking forward to seeing more from the expansions. It's been awhile, but I finally got around to making an Ariad card. She's definitely my favorite heroic lieutenant so far. Very cool idea for Ariad/Queen Ariad. Whoa, these look awesome! I'm totally gonna encourage my group to play with one or two of these guys in our next campaign. One nitpick, though: [awareness], [might], [intellect], and [willpower] for heroes always adds up to 11. Your Zachareth and Queen Ariad heroes add up to 12, though. EDIT: Holy crap that's an awesome idea for Ariad/Queen Ariad. Wow I didn't know that. Though Grey KerArvel Worldwalker, Lindel and Red Scorpion all add up to 12. If you end up using any of them, tell me how they work out! I gave Zachareth and Queen Ariad even stats (like some of the conversion kit scouts) because, for Queen Ariad, it's part of her heroic feat, while for Zachareth it actually makes his Hero Ability weaker. 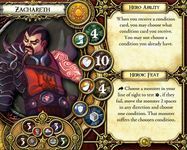 Each of the conditions is tied to an attribute, so if Zachareth had even one strong attribute it would make it too easy to choose which condition to take. With even stats it makes it a more thoughtful choice. Love the idea of flipping Ariad over to Queen Ariad, really good job! Q. Ariad side seems way OP. What about limiting the effect to a turn or two and changing the attack to a fixed roll of blue yellow green with some surges. Also you could reduce stamina to 1 or 0 when in Q Ariad form. 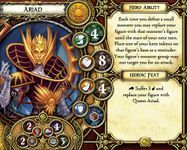 This seems to make more sense thematically and also work in act I.
I would have to think about the Hero Abilities usefulness a bit more, but some players would just suffer 3 fatigue on their first turn of each encounter for the more powerful Queen Ariad. I have no idea if Queen Ariad is balanced at all. My group is going to run an evil campaign with the lieutenants soon, and hopefully we'll be able to clean up any blatant imbalances! While Queen Ariad gets a green die instead of a free surge, she doesn't have access to Nanok's awesome heroic feat, which often blocks a devastating 6-8 damage attack. But, just because she's not as good as him doesn't mean she's not OP. I want to keep Queen Ariad's power simple and easily scalable from Act 1 to Act 2. Giving her a specific attack pool is really going to hurt in Act 2. Either way, giving up an entire action and nearly all of your stamina is going a high price to pay. Most heroes heroic feats give them an extra action and then some, so a heroic feat that actually costs Ariad time and stamina better do something worthwhile. 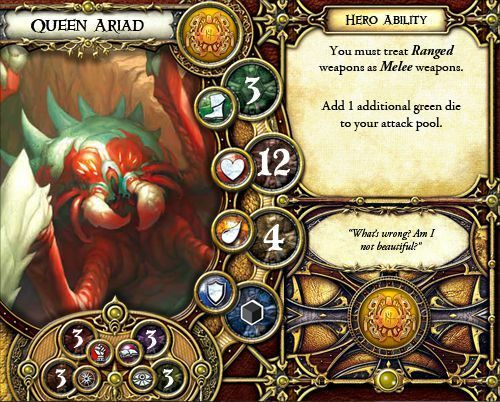 Queen Ariad - why would the player not just use it first turn (or maybe 2nd turn after clearing out the first monster group)? I don't think you would ever see the non-monster form used at all. Because she's now a melee mage, with the limitations that come with it. What about class skills? You only said weapon. Runemaster Break the Rune? In general, Queen Ariad seems more survivable. There's almost no point to using Ariad. Brown vs Black dice and same traits? And the green dice is a massive advantage, 66% surge + 0.66 heart damage, with the Runemaster +2 damage skill, her new form essentially gives the user +2 damage. Given most Act 1 weapons are average 1.5 damage and Act 2 are 2.5-3, that's a huge advantage. If I were playing her, I'd ditch the ranged rune weapons, buy inscribe rune, and rune mastery, then go buy a 2-handed grinding axe of x2 surge: +5 damage and start tanking the map. My first move would be to transform. My expected average damage would be 12.6, per attack. Maximum 17 damage. At least lower her stamina to 3. Maybe even speed 3. The simpler fix would be just to reverse the brown and black dice. Ariad looks like she has armor. Make Queen Ariad less survivable. Perhaps even write she can't wear armor. Not sure how the spider would wear human-sized chainmail. And definitely make the bonus green dice once per round. That said, these are fantastic. They don't seem to overpowered, some are pretty balanced. Aside from Queen Ariad, as I mentioned. I like the idea of the bonus green die only being added for the first attack every round. That keeps it from being abused too much. Now, it's true you could do a ranged attack with Break the Rune or Army of Death, but if that was your plan, you'd have to spend the action to turn into Queen Ariad, then a rest action to recover the fatigue you just suffered, and then at the start of your next turn, assuming the overlord has left a large group of monsters in your line of sight, you could use Break the Rune or Army of Death for a ranged attack. Spending 2 turns and your heroic feat to perform 1 ranged attack seems really bad, when Ariad could perform 3 attacks in the same time, and assuming she killed something, gain immunity to that monster group. I don't see the grinding axe scenario as a flaw with Queen Ariad. Runemasters output crazy amounts of damage, and any Runemaster could do the same thing with the grinding axe combined with the Sun Stone for a green die, or Mana Weave/Rune Mastery for a free surge. All heroes get ridiculously powerful towards the tail end of the campaign, but before you could get your grinding axe, Ariad would have to survive 6 quests without a weapon that responds that favorably to extra surges. 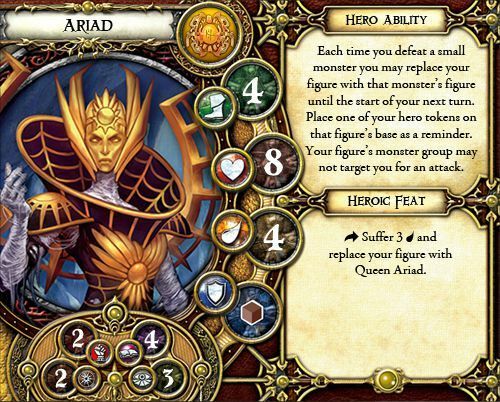 The reason to stick with Ariad over Queen Ariad is a slightly faster speed and her hero ability. As long as she's being attacked by 1 monster group she can blend in and avoid being attacked entirely, which is far better than having a black die and extra health. The time to turn into Queen Ariad is when that stops being possible. Ariad's hero ability is supposed to be useful enough to justify keeping her around for a little bit. Sorry, didn't meant to crap on your thread. Green dice once per round makes sense. You are right, the Sun Stone is a bit of a power creep weapon. This is in line with that. Though the Sun Stone is a relic, it's somewhat supposed to be a special thing, somewhere between a Hero Ability and a Hero Feat. I also sort of assumed you grab the 2x2 spider character for Queen Ariad? That would make her move points the same. Again, these are fantastic. I can't praise you enough. They are thematically very great.